All of us understand that it can be a difficult task to find the best and most unique wedding place card. It is even more difficult if you want to find a nice one in modern Chinese style. Here we would like to present this cheerful design to you. 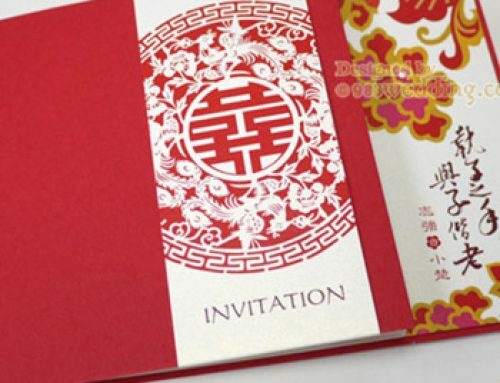 In Chinese tradition, red color and double happiness are treated as a symbol of luck and well-being. Usually, they will be going together in a single design. 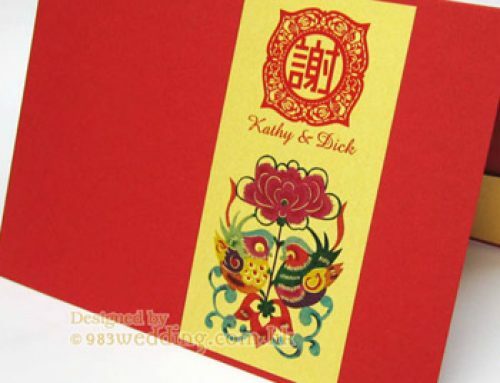 In this design, however, instead of putting double happiness symbol on the card, we manipulate the red color scheme as the key design elements. 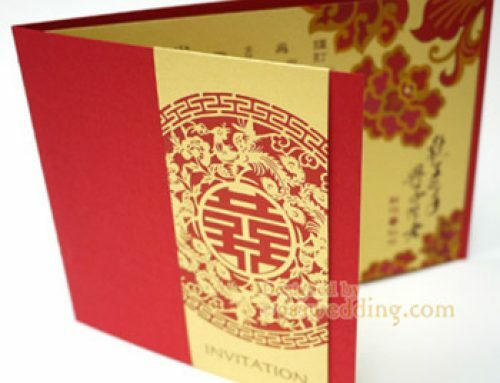 A Chinese abstract floral pattern with different shades of red color is printed on this place card. The Chinese touch of the design will be felt once you see it. The color contrast of the design is so eye-catching that your guests will not miss it when they are searching for their seats. The simple but strong visual impact adds a lot of cheerful atmosphere to your wedding banquet. As it is a simple place card, we do not try to make it too fancy. As a result, we make it a simple folded card. It will stand on the table in an “A” shape. The names of guests will be printed/written at the bottom part of the card. 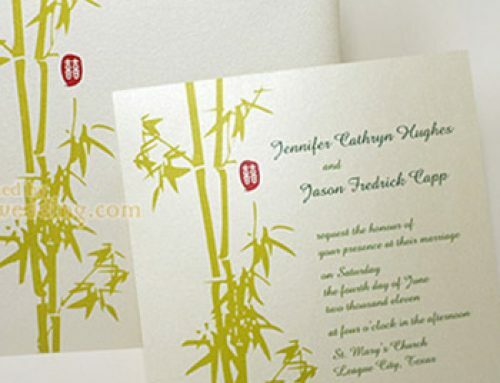 The design of this place card can match well with the invitation “A Match Blessed by the Heaven“. If a whole set of stationery is needed, it is totally possible to have invitations, menu, order of services, guest books etc. in the same set of design. Personalization is something vital in your wedding reception. 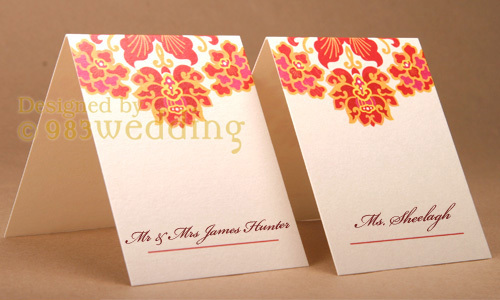 There is no exception for the place card, although it may only be one of the many items you will have in your wedding. This card can be personalized by putting your NAMES & DATE of your wedding on it. You can even put wordings which are unique, special and meaningful to your wedding on the back of it. If you are going to have us to print the names of your guests on the place card, you can also consider having some words unique to each guest printed along with the name of the guest. 1. 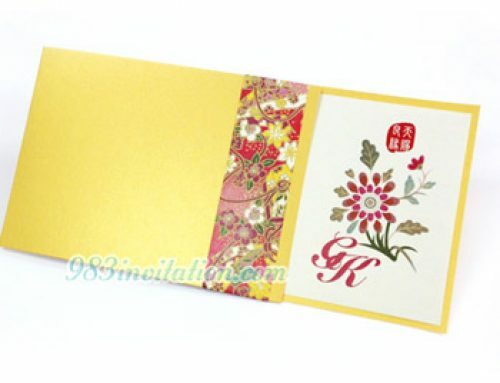 Normally, it is assumed that the brides and grooms will write the names of the guests on the cards. 2. Names of guests can be printed on request (with an additional charge).